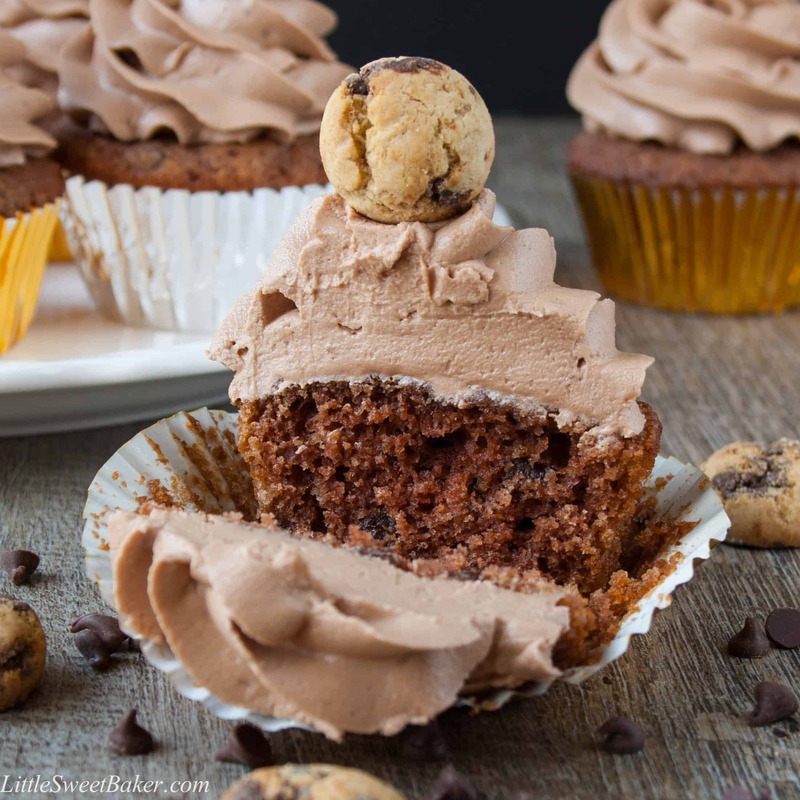 A delicious cupcake made with chocolate chip cookie butter and topped with a chocolate chip cookie frosting. The ultimate chocolate chip cookie lover’s dream! Warning: I will be using the words “chocolate chip cookie” a lot in this post. Since I missed everyone last week, I wanted to make something extra special for this week. I decided to combine two of my favorite things, chocolate chip cookies and cupcakes, so, without further adieu, I present to you, The Chocolate Chip Cookie Cupcake. It looks like a cupcake and taste like a chocolate chip cookie. The cupcake has a soft, moist, and delicate texture, with a light, fluffy frosting. It tastes like chocolate mousse with some subtle chocolate chip cookie pieces added in. I used President’s Choice The Decadent Chocolate Chip Cookie Spread in both the batter and frosting, which gave these cupcakes a real chocolate chip cookie taste. The cookie butter also makes the cupcakes extra moist. Now, this product is only available to us lucky Canadians. However, Trader Joe’s Speculoos Cookie Butter & Cocoa Swirl and Lotus Biscoff Spread would also work the same way in this recipe. 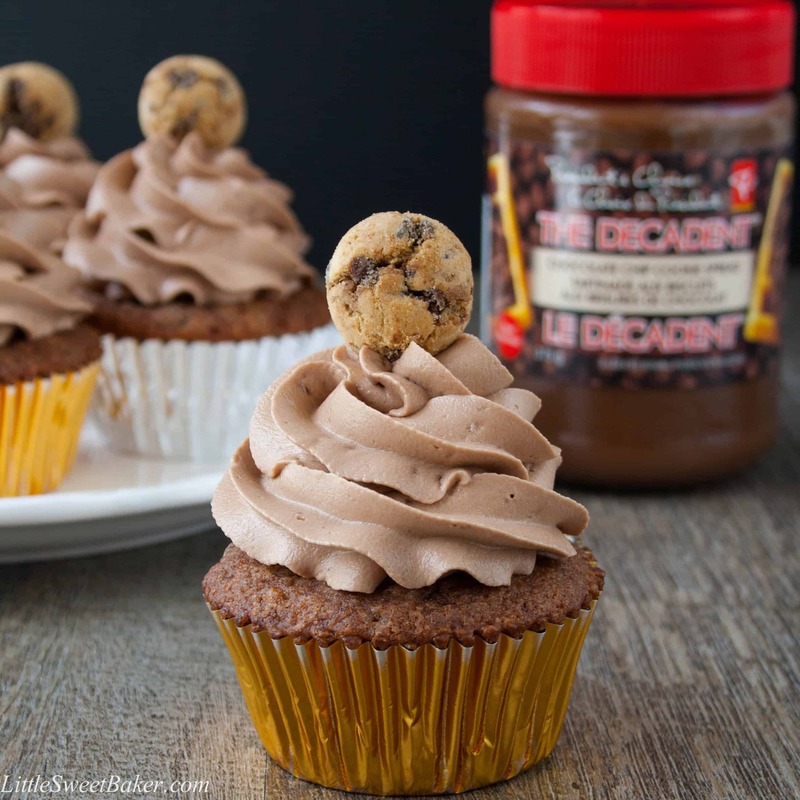 The Speculoos cookie butter will add a hint of spice to the cupcakes, and if you’re using Biscoff as a substitute, add 2 tbsp of unsweetened cocoa powder to the batter and frosting for the same chocolate flavor. I’ve read from other blogs that cookie butter makes a great frosting, and they weren’t kidding. Chocolatey smooth like a dessert mousse with little cookie bits hidden inside. My husband thought it looked and tasted like soft serve ice cream. 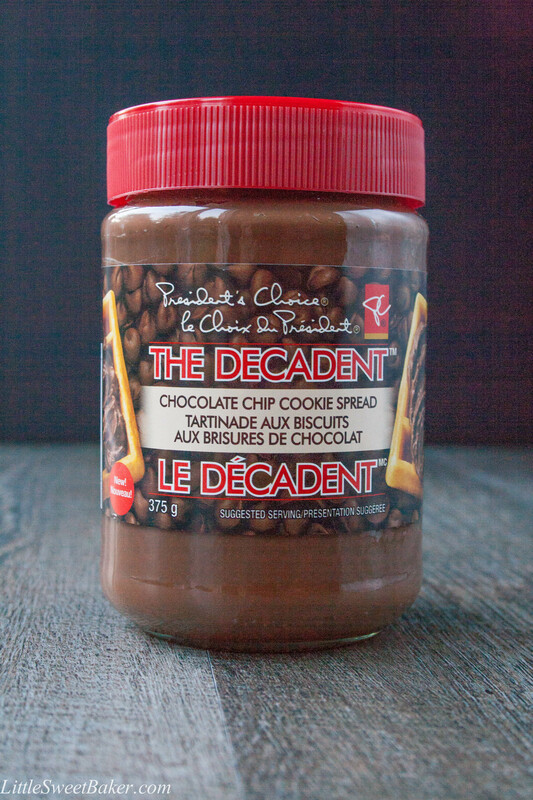 Whatever it looks like, this is by far the best chocolate buttercream you will ever eat. 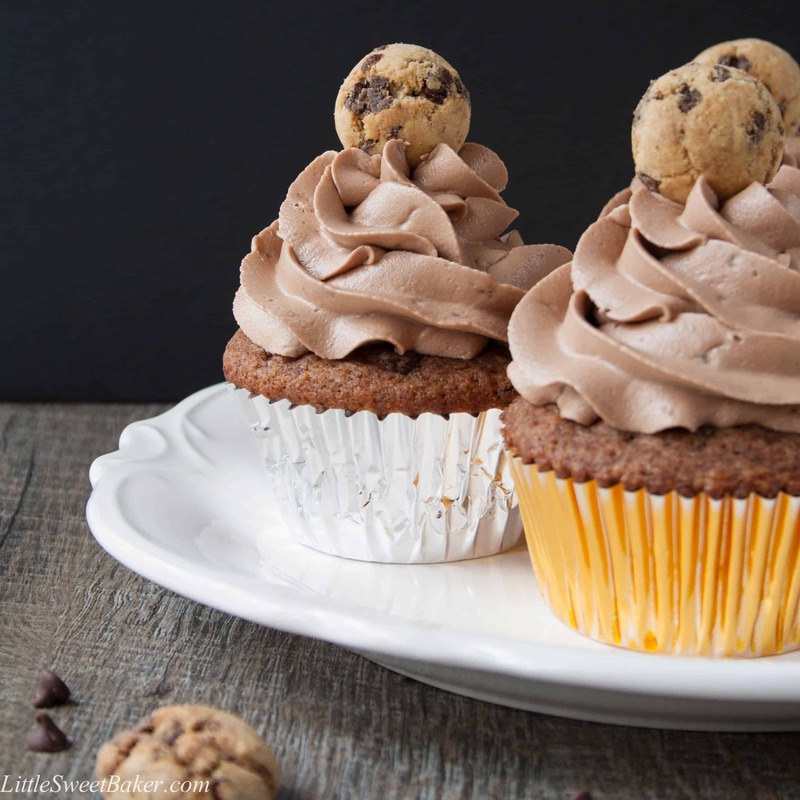 A delicious cupcake made with chocolate chip cookie butter and topped with a chocolate chip cookie frosting. 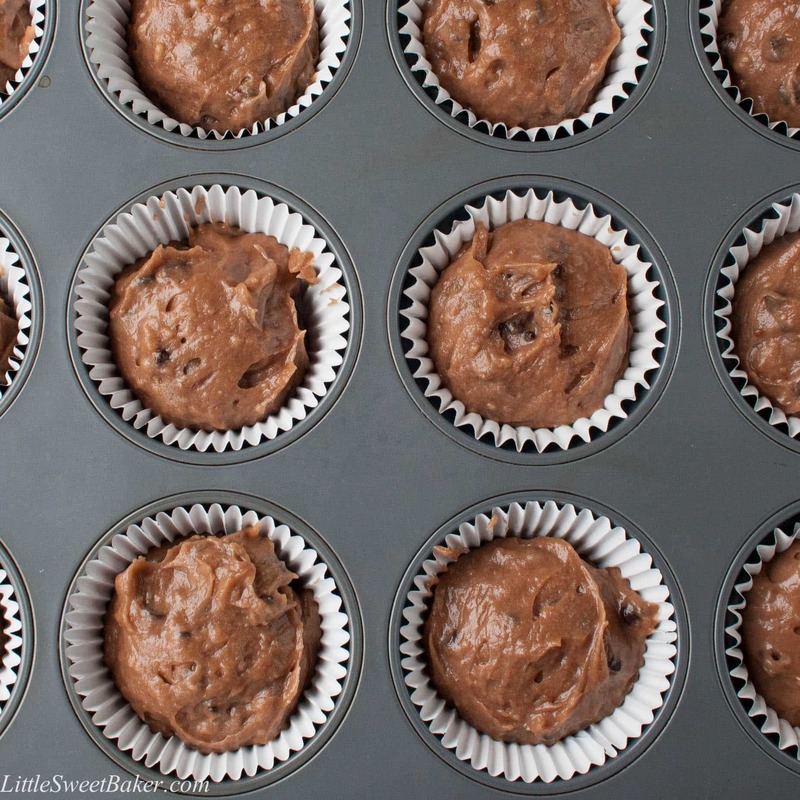 Preheat oven to 350°F and prepare a 12 cup muffin tin with cupcake liners. In a medium bowl, toss together the flour, baking powder, baking soda, salt and chocolate chips. Set aside. In a large bowl, whisk together the melted butter, sugar, egg, cookie butter, milk and vanilla. Slowly add the dry ingredients and gently fold together until just combined. Divide the batter among the 12 cupcake liners and bake for about 20-22 minutes or until a toothpick inserted in the center comes out clean. Let cool completely before frosting. To make the buttercream, use an electric mixer and cream together the butter and cookie spread. Combine the icing sugar. Then add the vanilla, salt and milk. Blend until smooth and fluffy. Cupcakes can be stored in an airtight container and refrigerated for up to 4 days. Bring to room temperature before serving. These cupcakes are so adorable! I made them with my son earlier today and we both devoured it! Looks yummy! Chocolate chip cookie in a cup cake…is the ultimate chocolate experience. I must try this! I love the icing curling up! Heavenly! How cute are those cupcakes!? 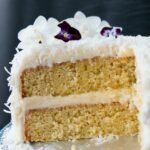 looks so moist and delicious… Yumm!! 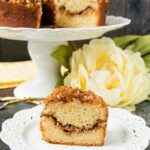 The crumb in these cupcakes looks insanely moist! Will try this recipe out when the occasion calls for some choc cupcakes 😉 And that mini cookie toppers are adorable! Very very interesting! I have tasted cookie butter at Trader Joes. 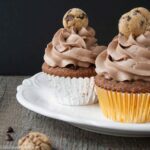 Ooh love the choc chip cookies on the cupcake, this is some serious chocolate chip cookie cupcake recipe! these have to be the best chocolate cupcakes i have seen in a while.. they are perfect! i would give the recipe a go however i doubt mine would look as good.. love the little cookies. yum! 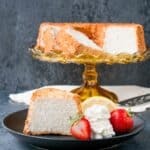 Your desserts always look so good Lily! They look amazing! Thanks for sharing!